The explosive Indian opener hammered 19 fours and 3 sixes as he reached his century in 91 balls on the opening day of the historic India-Afghanistan test match at Bengaluru's Chinnaswamy stadium. 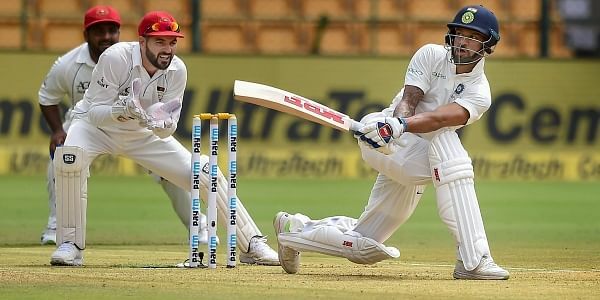 BENGALURU: Shikhar Dhawan today became the first Indian player to score a century in Test cricket before lunch, joining an esteemed list of former cricketers, including the legendary Don Bradman. The explosive Indian opener hammered 19 fours and 3 sixes as he reached his century in 91 balls on the opening day of the historic India-Afghanistan test match at Chinnaswamy stadium here. He became the sixth player in the world to score a century before lunch. Last year, Australia's dashing opener David Warner scored 100 not out before lunch against Pakistan. Other five players who achieved this milestone in the past are Victor Trumper (103 not out before lunch) against England in 1902, Charlie Macartney (112 not out) against England in 1926, Bradman (105 not out) against England in 1930, Majid Khan (108 not out) against New Zealand in 1976. Before Dhawan, the previous record for best score for India in the first session was held by Virender Sehwag, who had scored 99 runs in St Lucia against West Indies in 2006. It was Dhawan's 7th Test century in 30 matches. India are playing the historic match without the services of skipper Virat Kohli. Afghanistan was granted Test status in June last year along with Ireland.